Session Beer Day returns 7 April 2015. On 7 April 2015, celebrate Session Beer Day! 7 April is the day, in 1933, that beer became legal again in the United States after thirteen years of Prohibition. Well, sort of. In 2009, beer writer Lew Bryson 'formalized' his campaign to bring back American session beers —that is, well-flavored beers of less than 4.5% alcohol-by-volume— with his Session Beer Project blog. Since then, he has asked brewers, pub owners, and good-beer drinkers to work toward the return of session beer to America. And, now, in 2015, he asks us to celebrate its return. Session Beer Day 2015 is on for April 7! After several years of being on the cusp, of thinking 'okay, this is the year session beer goes mainstream! ', we're here. Almost every beer bar I walk into these days -- hell, here in Philly, almost any new bar I walk into -- has at least one session beer on tap. Every major brewer has a session beer in their portfolio (or comes grudgingly close). There are session beer events regularly, there are brewers who make only session beers, session beer has been recognized as one of the major trends in craft brewing. We can do Session Beer Day right this year. How to define a session beer is open to debate. The Encyclopedia of Beer (1995) defines it as a beer a person can drink throughout the evening withot becoming inebriated. ... beers that are under 4.5% ABV, that are flavorful -- sorry, no mainstream light lagers need apply, that's just how it is. [...] It's a common taunt: "People who drink light beer don't really like beer; they just like to pee a lot." Well...if you're going out to drink beer, why get hammered on two or three huge beers? If you really like to drink beer, why not find a good, flavorful session beer and have five? I mean...if you like drinking beer, and the conviviality and social fun that goes with it, why not have a beer that lets you keep doing that longer? I've read descriptions of 8% alcohol beers as 'sessionable.' Ha! To paraphrase former Supreme Court Justice Potter Stewart: "I know a session beer when I see it, and an 8% alcohol-by-volume beer is not that." And, it's better not to ignore the vocal subset that disputes Mr. Byson's upper limit of 4.5% alcohol-by-volume (3.6% by weight), calling instead for one of 4.0% or less (3.2% by weight). Theirs is an argument historically accurate in terms of what happened in the U.S. in 1933 (and of beer history in 20th century Great Britain), but one that can be rendered moot by calling for a modern American session beer. But insist on 4.5% or less. If it ain't significantly less, it ain't significant. We've watched "IPA" become an increasingly meaningless marketing term; even "craft beer" is being hollowed out by arguments over what is and what isn't. I welcome the discussion of whether session beer should be under 4.0%, but I dismiss the idea that it is under 5.0%. There's just not enough difference to be different there. If you want more on why, I've written plenty: have a look. Even only a few years ago, Mr Bryson (and many of us session guerillas) would often be told that session beers would never work: 'craft' beer drinkers wanted bang for their bucks. My response has been: if alcohol is the goal, beer is a poor delivery system. Try Everclear, instead. But shouldn't brewers be charging less for lower alcohol beers? No, says Mr. Bryson! But we've had that discussion, and the truth is, lower alcohol beers don't really cost that much less to make or sell. Materials -- hops, malt, spices -- are only part of a beer's cost; there's energy, labor, transport, taxes, promotion, facility costs, debt service... If a pint of 4.5% pilsner is a good pint, a good-tasting beer, why should it be cheaper than a 6.5% IPA? Because it cost a nickel less to make? Or because it has less alcohol? I thought craft beer was all about flavor. If it's about the alcohol, well...why are you drinking it, again? Maybe you ought to think about that. In any case, I'd certainly encourage any brewpub operator or bar manager to think about dropping pints a buck just to encourage the multiple sales sessions are about, but it's not about session being a somehow "lesser" beer. We don't buy that, no matter what the price. Brewers, get your little beers ready. Bars, get your little beers on. If you're a bar manager: please consider putting at least three beers on tap that are 4.5% or under. If you really want to support things, don't make them all "session IPA" choices; the Session Beer Project has always been about expanding choices. Lead, don't follow. Find something different, and reward it. If you have equipment for cask ale, by all means put the session beers on if possible; that's where they shine. And the rest of us? Start asking if YOUR local is doing anything for Session Beer Day. Start planning what you're going to do; get creative! If you've got good stuff, let me know! Tweet it up: #SessionBeerDay. Get ready for OUR DAY. Session Beer Day. April 7. Dream Big for Small Beer! So, what is Session Beer? Why, it's the one beer to have when you're having more than one! And, it's the one with Goldilocksian character: not flavor-hyped, but definitely not flavor-wanting. Just right. Miller Lite fails the character test; Mild Ale, by contrast, doesn't. 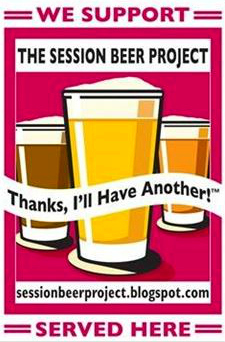 Read the full Session Beer Day announcemnt at Lew Bryon's Session Beer Project: here. Lew Bryson is the editor of Whiskey Magazine. He maintains another blog at Seen Through A Glass. He is the author of Tasting Whiskey, published in 2014. He can be followed on Twitter @LewBRyson, and on Facebook. Pic(k) of the Week: Three stars (of brewing). Who, and what, is the (U.S.) Brewers Association? How beer as a whole fared in the U.S. in 2014. Pic(k) of the Week: Barleywine, while snow falls.